I sort of stole this idea from Pinterest. Okay, I completely stole it. 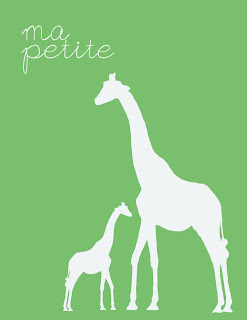 But the one I saw had birds and I wanted giraffes. "Ma Petite" means "my little one"
PS Remember, you can save these directly to your computer from my blog OR if you are going to print them larger than a 5x7 I recommend downloading them from my shared dropbox Printables folder here. PPS Remember if you are looking for a specific printable you can request it by clicking on the tab at the top of my blog "Request a free printable." I'm quickly running out of Dropbox space. In order for me to keep posting lots of free printables I need more space...desperately! Click here and get a dropbox account. Doing so through that link will put me as your referral and I will get more space. Free Printable: "Fear Less, Hope More"
Jack Jack: First Broken Bone! Free Printable: "Imperfection is Beauty"